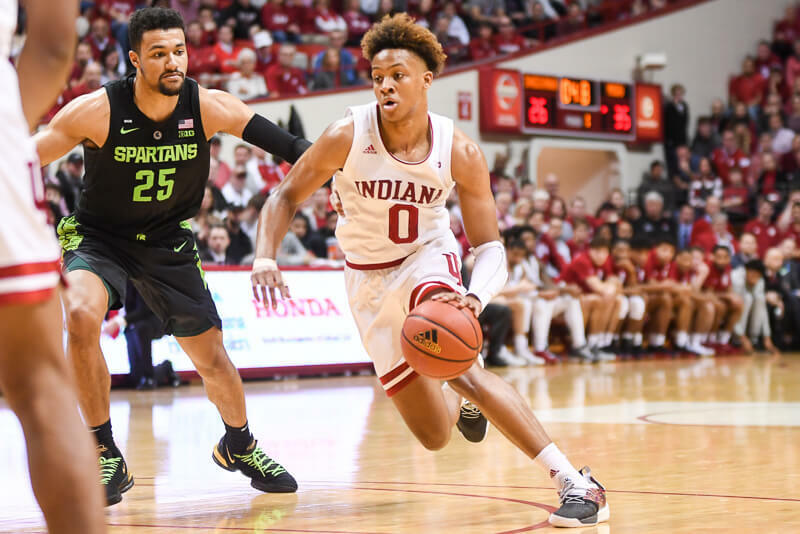 Indiana shot the ball so well in the first half Monday night against Howard, it seemed as if everything the Hoosiers threw up was going to go in. The No. 17 Hoosiers (11-0) made nine 3-pointers in the first 20 minutes of their 107-50 win, capped by Jordan Hulls’ fourth of the half with 49 seconds left. The fact that Hulls connected on a three was not a surprise. The way in which he did it, however, was certainly unorthodox. With the shot clock running down, Hulls dribbled hard to his left. When he was unable to get past his defender, the right-handed junior shot and made a left-handed 3-pointer while still on the move. Hulls finished with a game-high 16 points on 5-of-6 shooting, including 4-of-5 shooting from beyond the arc. He’s shooting 24-of-41 from three for 58.5 percent, the fourth highest mark in the country. As a team, the Hoosiers hit 11 3-pointers on 20 attempts with seven players making at least one. With the win, the Hoosiers have their best start since the 1975-76 season – the year Indiana went 36-0 and won the national title. Crean didn’t want to compare his team to the ’76 national champions, but he acknowledged how special it is to even be mentioned in the same sentence with them. 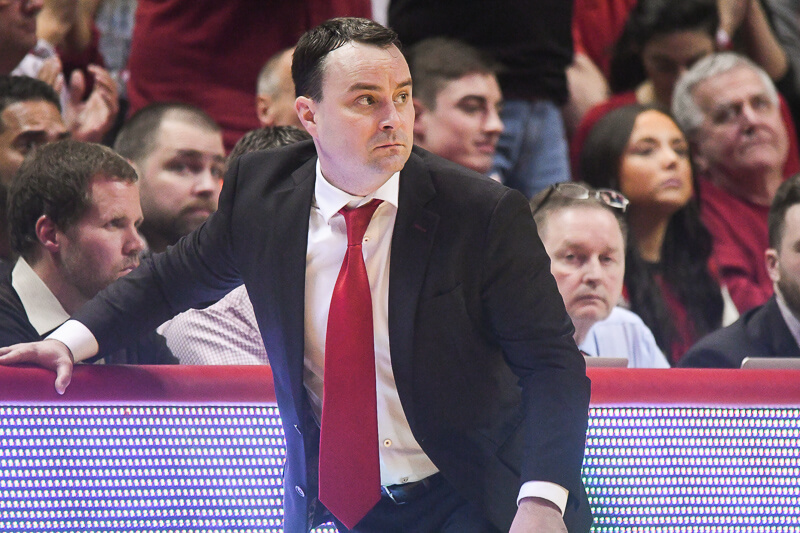 If the Hoosiers beat the University of Maryland Baltimore-County Thursday night, they would match the most wins by a team in the Crean era before they play a single Big Ten opponent. Since the Hoosiers had the game well in hand by halftime, Crean was able to go deep into his bench in the second half. The Indiana bench combined to make 15-of-20 shots for 47 points, led by Will Sheehey with 12 points. Freshman Remy Abell turned in his best performance of the year, finishing with nine points and five assists in 14 minutes. Abell saw a good amount of time at the point guard position in relief of Hulls, and he didn’t commit a turnover. Even sparingly used senior Kory Barnett got into the scoring column with a late contested 3-pointer. Barnett, who had scored only two points all season, thought he may have been fouled, too. Barnett plans to go into coaching after he graduates. 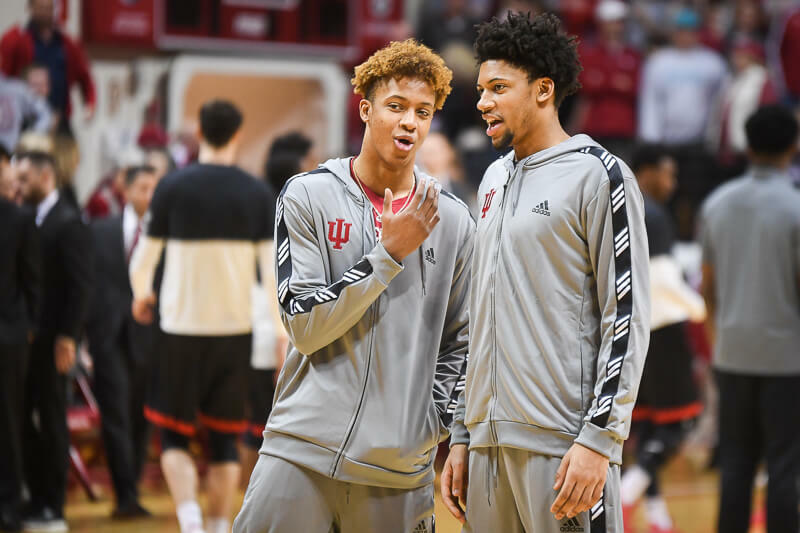 Crean believes he’ll be successful. Does any have a video of that left handed three? Any video of that Hulls shot? What is the Howard player doing in that photo? Weird. Hulls was trying to draw a foul with the shot clock winding down and at a minimum draw iron so it wouldn’t be a shot clock violation. The defender was simply trying to get out of the way so he wouldn’t get whistled – hence the hands behind him. I agree with you though, it does look kinda weird from that angle. Looks like he is trying to stop “the Movement”? Yeah, I knew what he was trying to do (or not do) but it still looks super weird, right? You sure about that Will? I thought Watford’s shot against pUKe was pretty good. Who knew that Vanilla Ice is a Southpaw!? Ridiculous, utterly ridiculous. Hulls shoots 100% from the stripe, so fouls on Hulls need to be referred to as charity fouls because they’re just giving points away. He shoots 58% from any spot on the floor. Now he shows us a left handed three pointer while trying to draw a foul for a four point play. I’m an unworthy spectator to this 2009 Indiana Mr. Basketball. VJIII goosed him. So we need to credit him with 1 more assist. Purdue gave me this PhD simply because I had a 12th grade reading level. They have very low expectations. Are you sure that’s not a turnover? Hulls is STELLAR! How about this list with Cliff Alexander http://sports.espn.go.com/ncb/recap?gameId=313540096 . . . talk abiout an IU EPIC 6 year run for the HOOSIERS going to the FINAL 4 and also winning at least 3 NATIONAL CHAMPIONSHIPS! NO IU recruits listed in ESPN rankings for 2013 http://sports.espn.go.com/ncb/recap?gameId=313540096 . . . sigh. Does it really matter when we are WINNING 3, yes count that THREE NCAA National Basketball Championships!!! THE MOVEMENT is on!!! I think we may be giving Hulls too much credit for his basketball IQ. Look at it this way—Jordy is 24-41 for the season on 3-pointers, which is 58.5%. That’s a phenomenal statistic for just about anyone, and if you subtract the left-handed shot 23-40 end up being the same percentage. However, I don’t think it looks very smart to continue shooting right-handed and missing 41.5% of your shots when you’re a 100% shooter on left-handed threes. Somebody needs to coach this kid up! Nausea, heartburn, indedgestion, upset stomach, diarrhea. Ooh, Pepto Bismol.